Home > Battery Eliminators > Yaesu & Vertex Standard > CBE-27 : Battery Eliminator for Yaesu FT-530, FT-816, FT-416, FT-26R, FT-76R, etc. 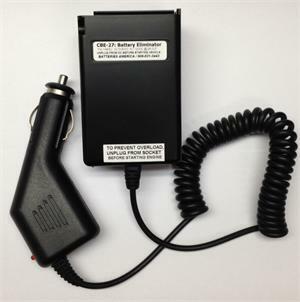 CBE-27 : Battery Eliminator for Yaesu radios such as FT-530, FT-816, FT-416, FT-26R, FT-76R, FT-815, FT-415, etc. Plugs into 12-13.8VDC socket, has coiled cord, & other end slides onto bottom of radio. Voltage regulation & Noise-filtering circuitry built into housing. Enables operation of the radio from a vehicle 12VDC socket, or similar 12VDC power souce.